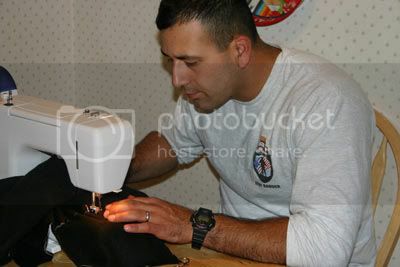 6 foot 4 with rock hard muscles, and he sews. Alex is now allowed on the *good* machine. He wasn’t when this picture was taken. He’s still NOT going to be allowed near my new Ginghers. He may never be. 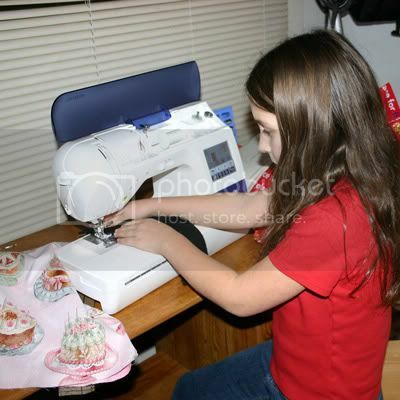 Olivia was sewing a pencil pouch she designed from scratch. She’s brilliant. Don’t you love a man that will sew? 🙂 My DH always sewed on all his patches etc..when he was in the military. Gotta love that. It’s amazing how much military guys can do for themselves! DH does his own laundry and irons . . . he says he’s so used to having to do it himself anyway . .love it! !